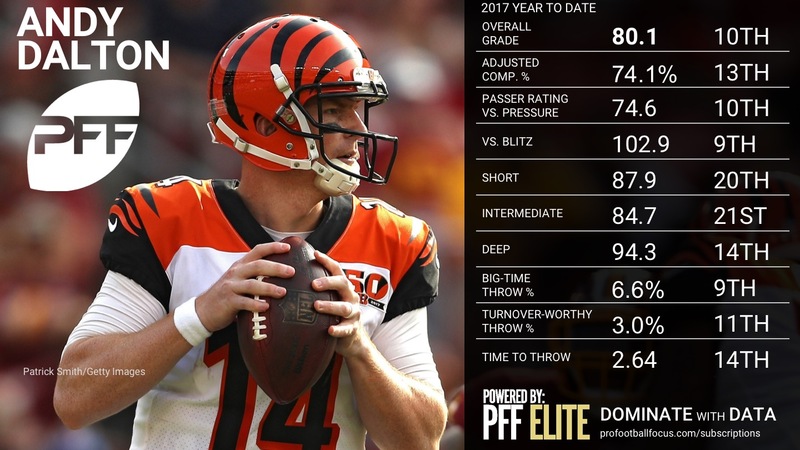 PFF Analysts Steve Palazzolo and Zac Robinson give you an overview of every team’s quarterback, and where they rank in terms of overall PFF grade as well as detailed notes on a select few who stood out for good, or bad, reasons in Week 9. 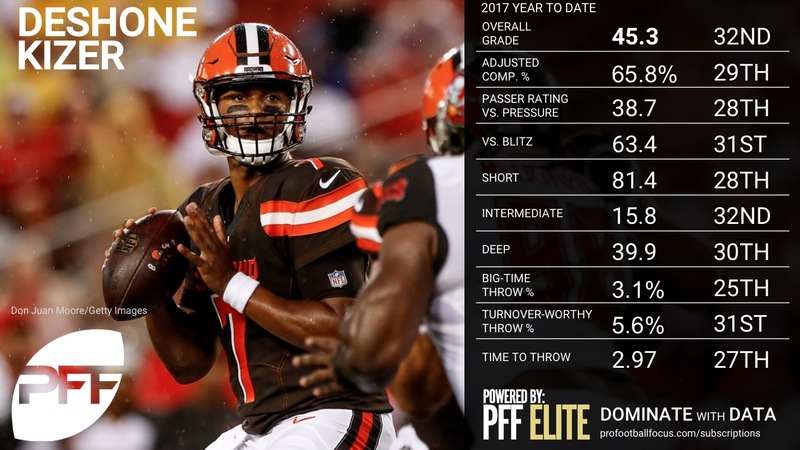 These rankings are based on their overall grades after Week 9, and can be found as a part of the PFF Edge subscription. 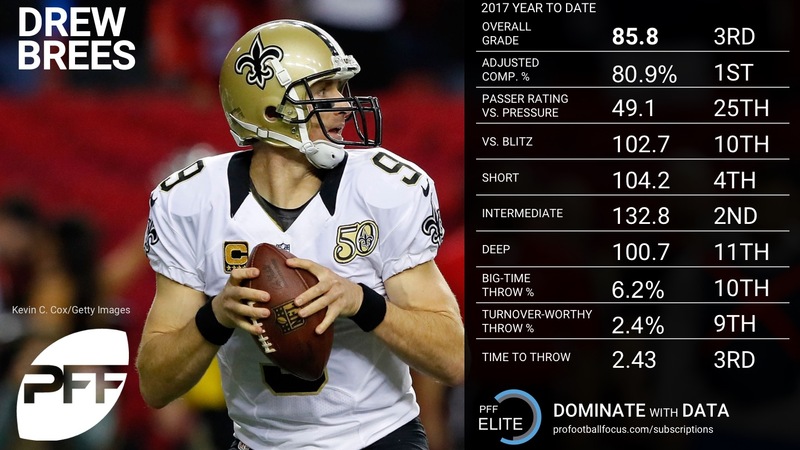 The stat sheet looks great as Brees went 22-for-27 for 263 yards and two touchdowns against the Buccaneers, but he was aided by a dropped interception early in the game and he had held the ball too long in the pocket before fumbling later in the game. One of his touchdowns was a 28-yard screen pass to RB Alvin Kamara, part of an effort that saw Brees pick up 57 percent of his yards after the catch. His best throw of the day was his 36-yard touchdown to WR Ted Ginn deep down the middle of the field, one of three passes that he completed on five attempts over 10 yards. 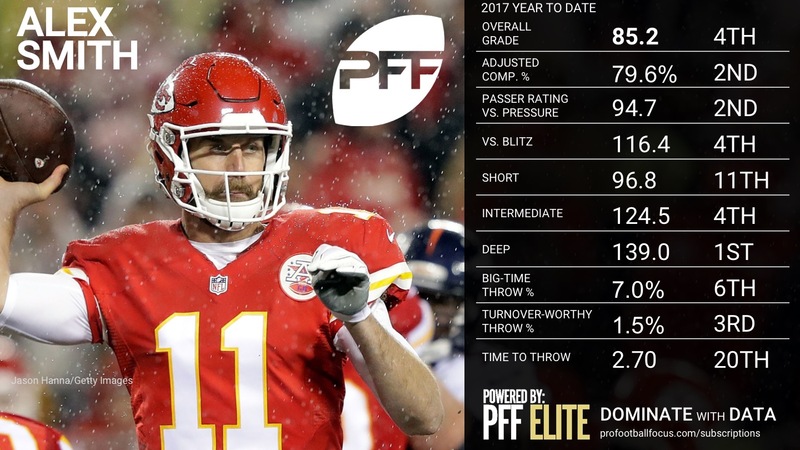 Smith has come back down to Earth in recent weeks, and while his stat line looked good, an end-of-half miracle by WR Tyreek Hill boosted his passser rating from 86.3 to 102.9. 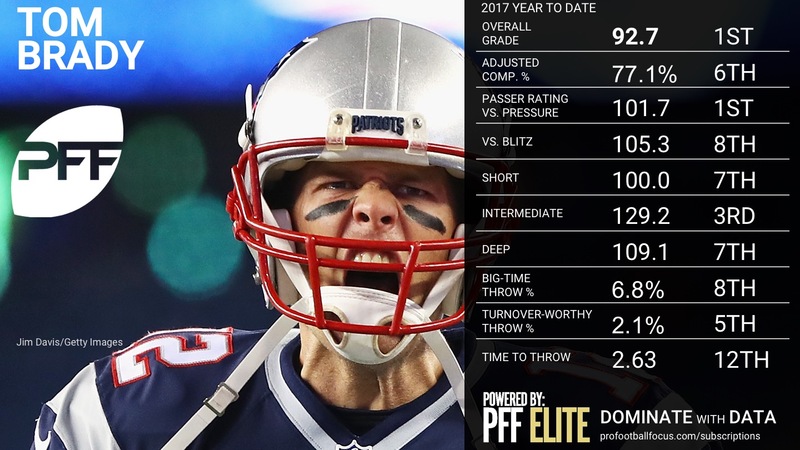 He didn’t look comfortable in the early going and missed on a number of throws throughout the game with his most egregious error being a fourth down force into double coverage with the game on the line. Smith’s best pass of the day was a downfield strike along the sideline to Hill that was incomplete due to good defense, but overall, it was not the best we’ve seen from Smith. 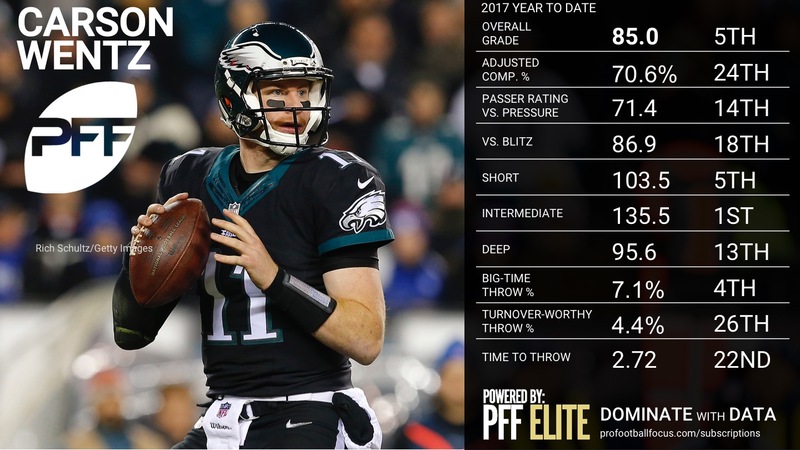 Wentz continues to operate the Eagles attack at a high level. 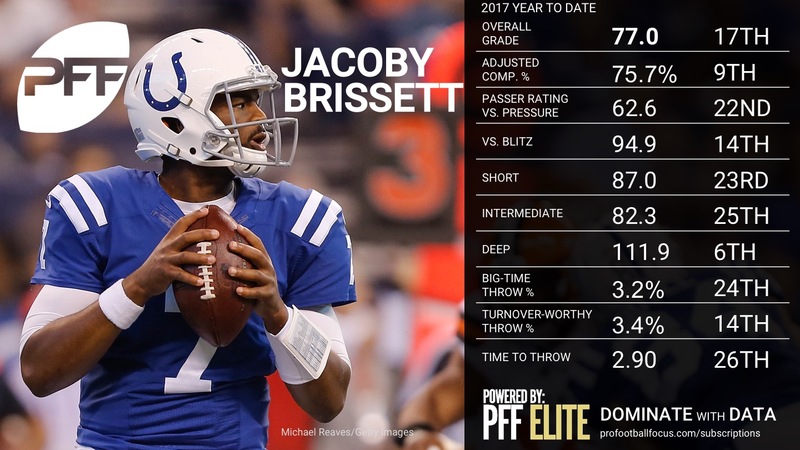 After missing a few throws early, he was able to settle in and play in a good rhythm, throwing with great accuracy on a number of timing routes to the outside. The Eagles keep evolving concepts within the offense that make them one of the toughest in the NFL to defend, evident by the “screen and go” look of of a run pass option that Wentz was able to find Alshon Jeffrey behind the defense for a TD. 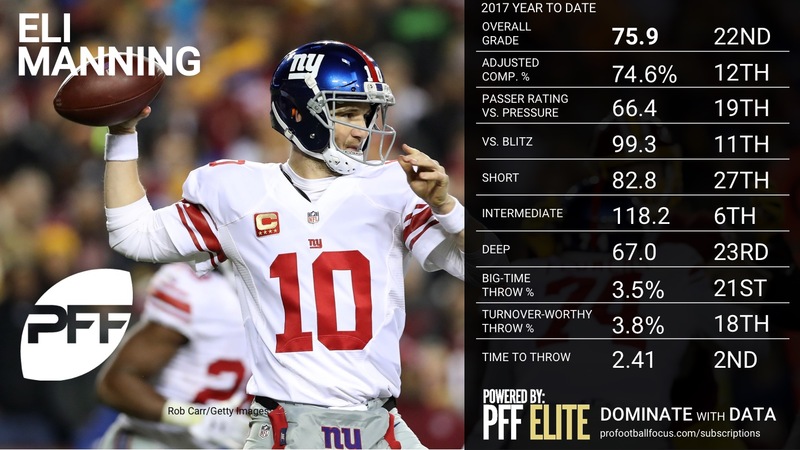 Defenses continue to be at state of flux with how to defend Wentz and the Eagles, as they face the highest percent of man coverage against them in the NFL at over 45 percent. 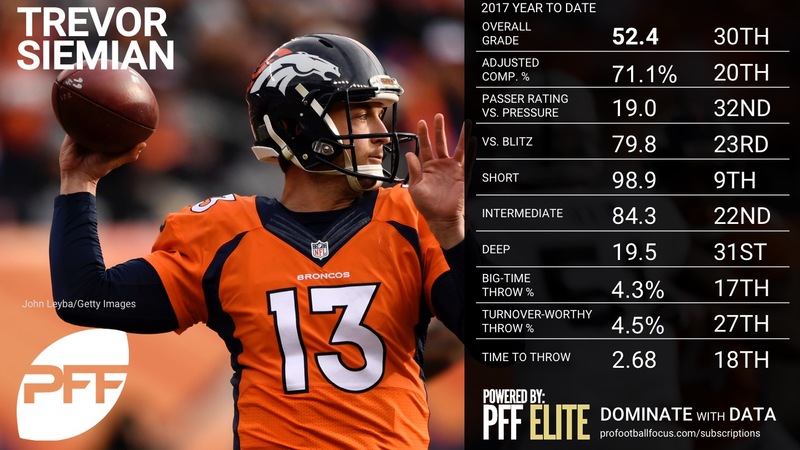 Wentz keeps burning them in the process with big plays against man, as last week he averaged 9.4 yards per attempt and and 75 percent of his 199 passing yards came against the Broncos man-to-man coverage. 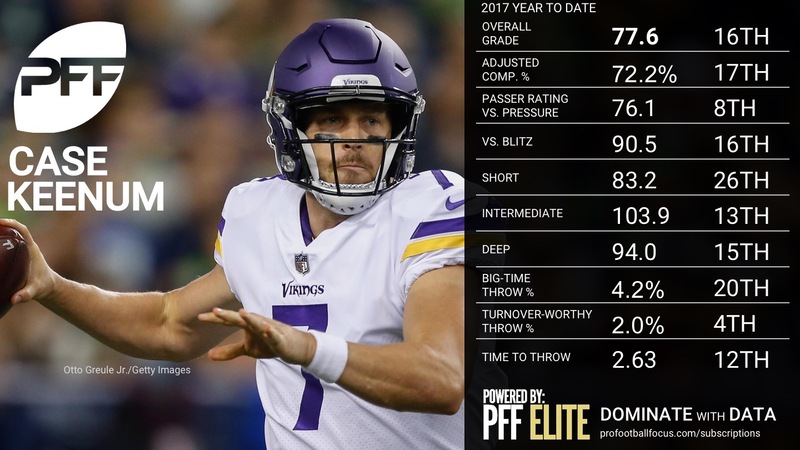 Ryan has been playing in good form in recent weeks throwing the ball with the type of accuracy we saw from him in his 2016 MVP campaign. This was his best passing display of the season, as he excelled at each level and area of the field. 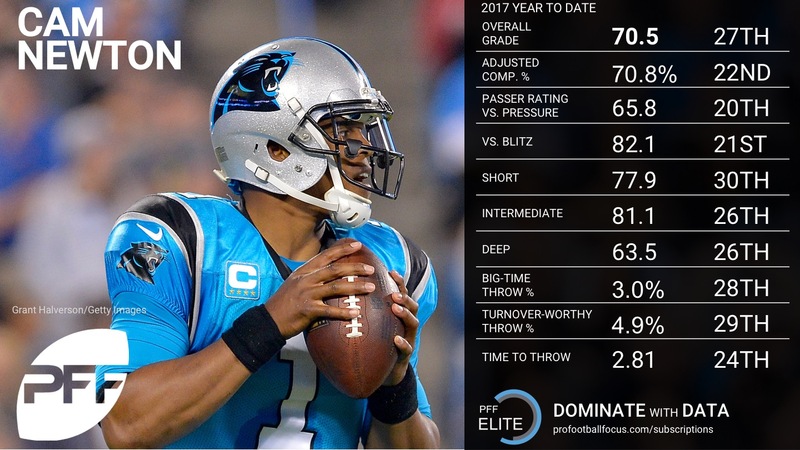 Ryan was able to slice through the Panthers blitz schemes, as he completed 81 percent of his throws for 205 yards and a 118.8 passer rating against the blitz. There were a few plays left on the table, as he threw an interception on a miscommunication with Austin Hooper over the middle of the field as Hooper drifted up the field and allowed the safety to undercut the route. 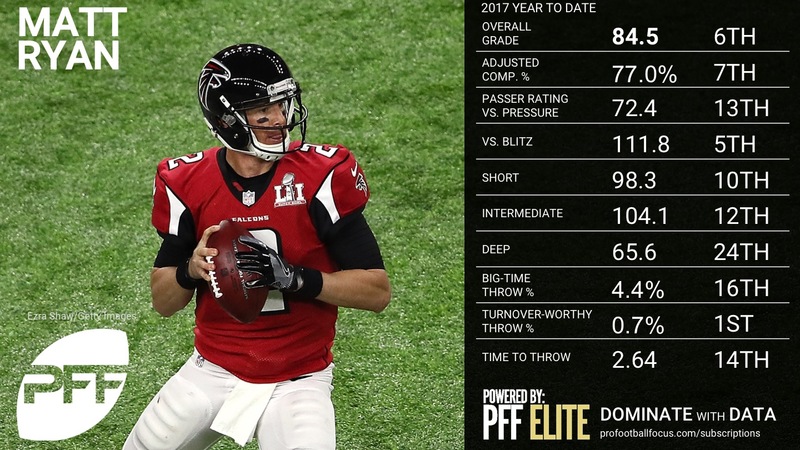 The biggest play however came in the fourth quarter on a 4th-and-7 where Ryan found Julio Jones on a double move behind the defense, taking a hit while he threw, only for Jones to have an uncharacteristic drop for the would be score. 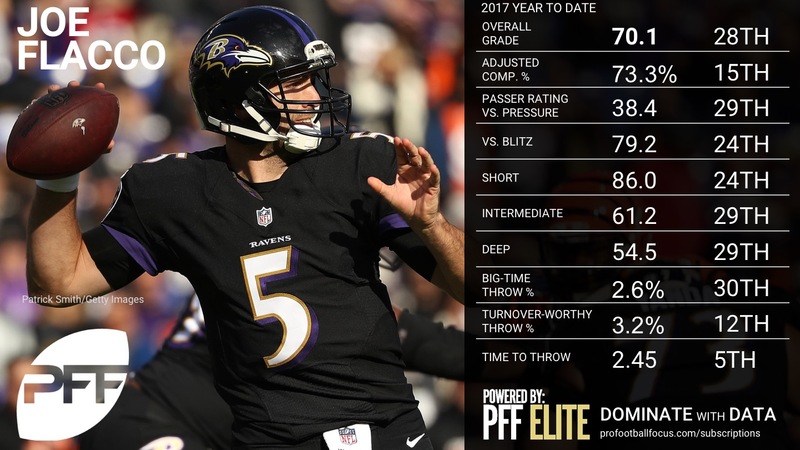 Ryan’s accuracy and the overall rhythm of the offense are certainly trending up despite the loss. 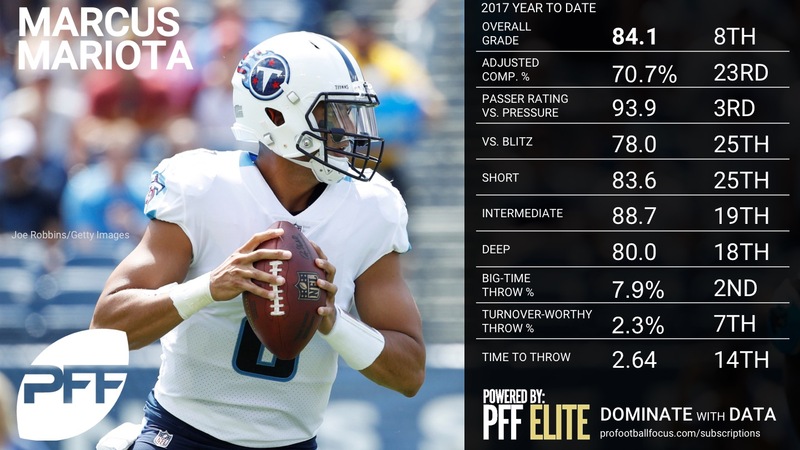 Mariota got off to a hot start, finding big throws down the field using play action effectively. 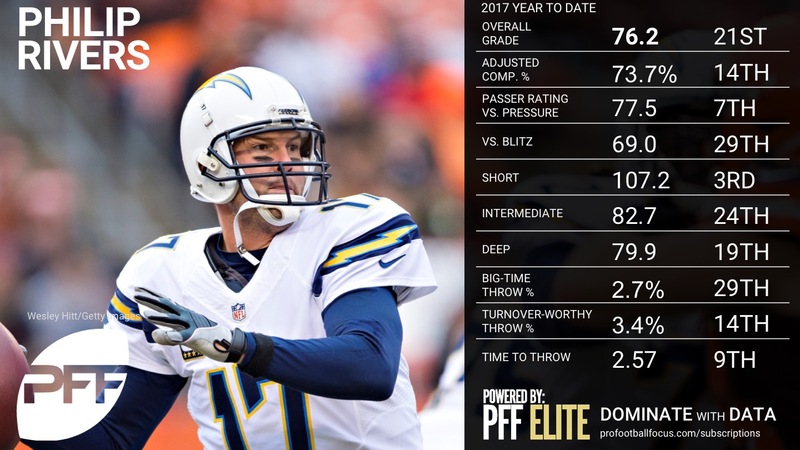 It was a fairly up-and-down game after the first quarter, as he was able to find completions underneath but badly overthrew a corner route that was picked off by Eric Weddle on a play he took him there with his eyes from the snap. He saved his best couple plays when they needed it the most in the fourth quarter, hitting Delanie Walker up the seam off of play action and finally maneuvering and finding Eric Decker across the field for the game-sealing touchdown. 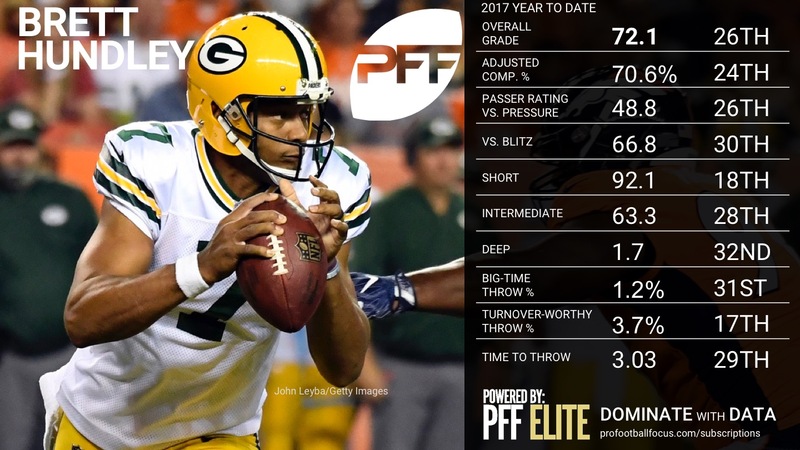 Mariota has been deadly off of play action this season, currently leading the NFL in yards per attempt at 11.7, and the second-best passer rating of 137.5. 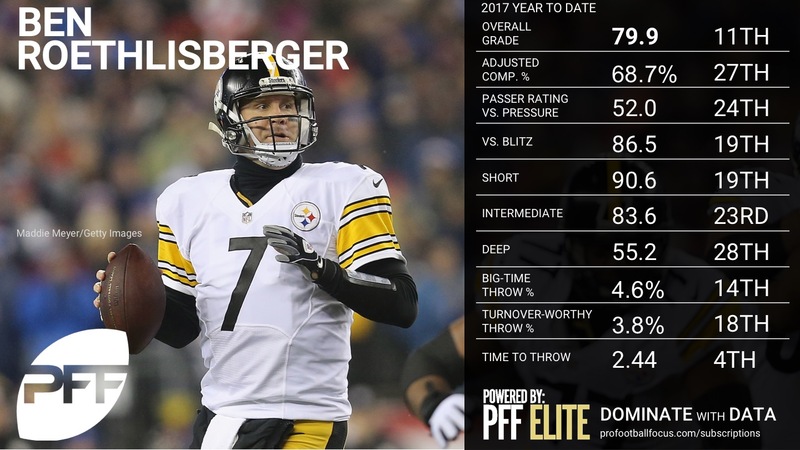 His passer rating on throws where he has not used play action is a bit eye-popping, as his 68.9 passer rating on non-play action plays sits him fourth-lowest in the NFL. A rocky start for Cousins ended in triumphant fashion as Cousins overcame poor decisions and the tough environment in Seattle to make two big-time throws down the stretch. 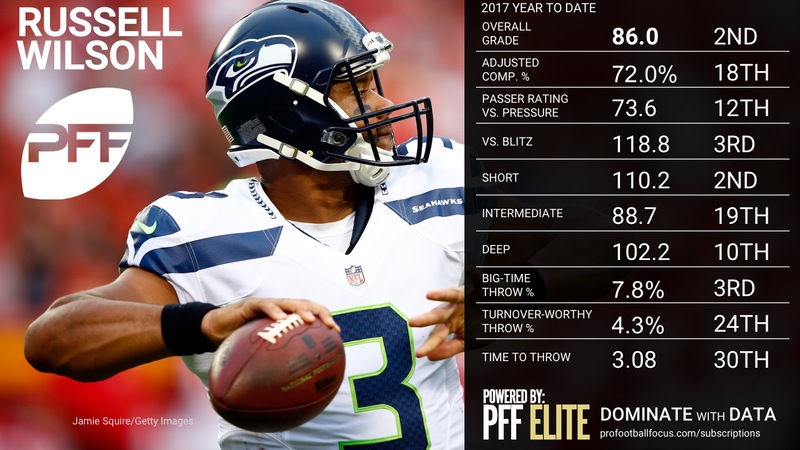 Early in the game, he got away with two dangerous passes, including one thrown right to CB Richard Sherman who dropped the easy interception opportunity. Cousins was under quick pressure for much of the game, taking six sacks, including a safety, but he continued to bounce back and his final drive featured a well-placed corner route and a deep ball to WR Josh Doctson that set up the game-winning score. 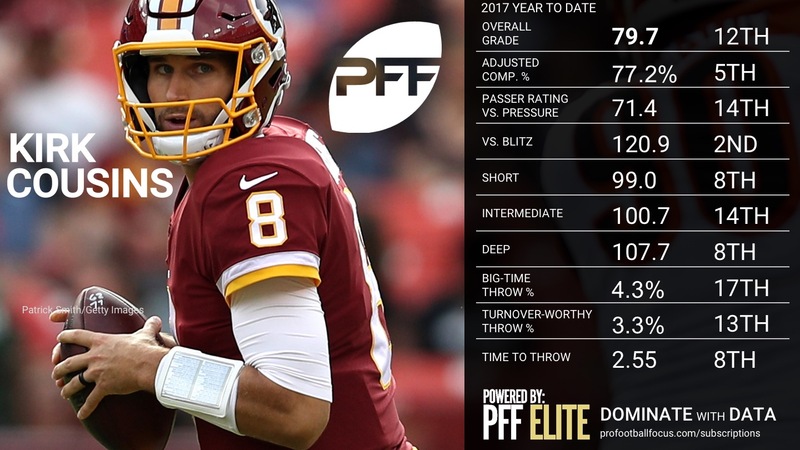 It was a much-needed clutch performance for Cousins down the stretch who didn’t have his finest throw-for-throw outing, but those two passes were just what Washington needed to keep their season alive. Top-end Matthew Stafford is as fun to watch as any quarterback in the league. 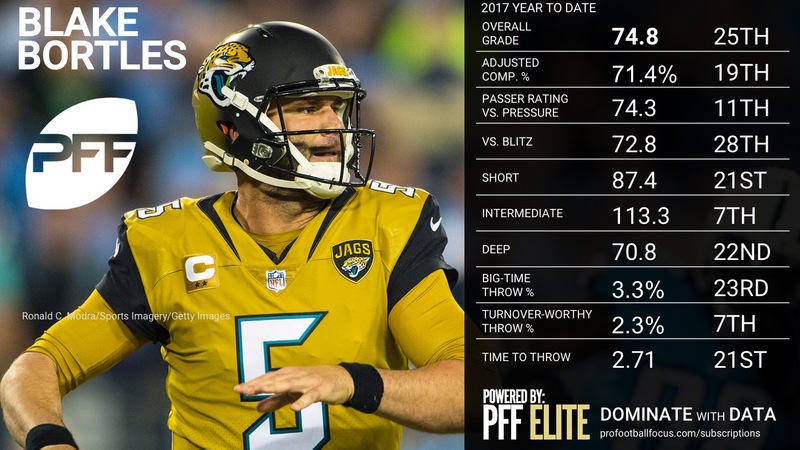 He’s been feeling it the last few weeks, and particularly on Monday night against Green Bay, he continually threw the ball accurately into tight windows with the velocity that we’ve become accustomed to from one of the best arms in the NFL. 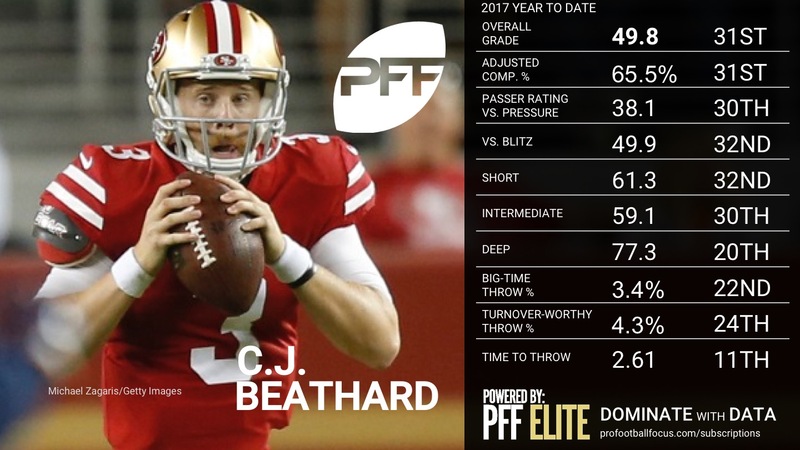 Stafford was well-protected for much of the night, but even under pressure, he fired accurate passes confidently, and he had the proper touch, zip, or arc to make a variety of impressive throws. 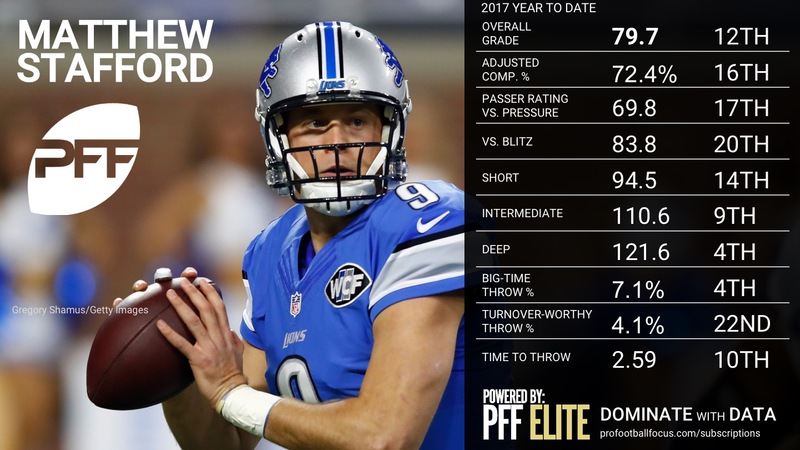 Stafford finished 9-for-11 for 143 yards and a touchdown at the intermediate (10-19 yard) level while throwing with good ball location in the 0-9-yard range, finishing 8-for-11 for 101 yards. 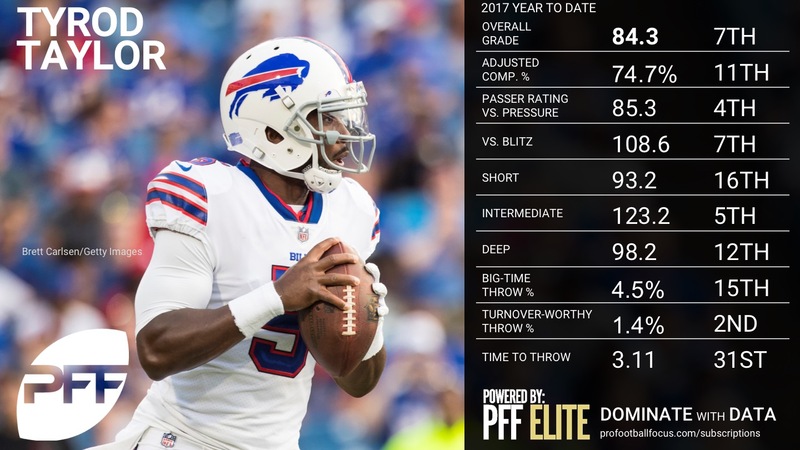 A week after a tough outing at Buffalo, Carr bounced back with a crisp game overall in Miami. Carr found the matchup he liked with Jared Cook a number of times, connecting on a number of well-placed out-breaking routes as well as a big time throw on a go route vs Kiko Alonso. 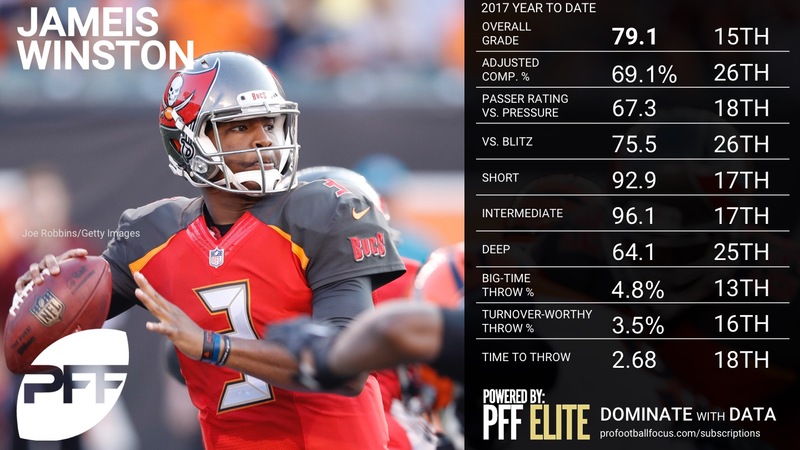 Coming into this game, Carr was tied for the second-fewest number of big time throws, but was able to get down the field again finding Johnny Holton in tight coverage off of play action for a 44-yard touchdown. 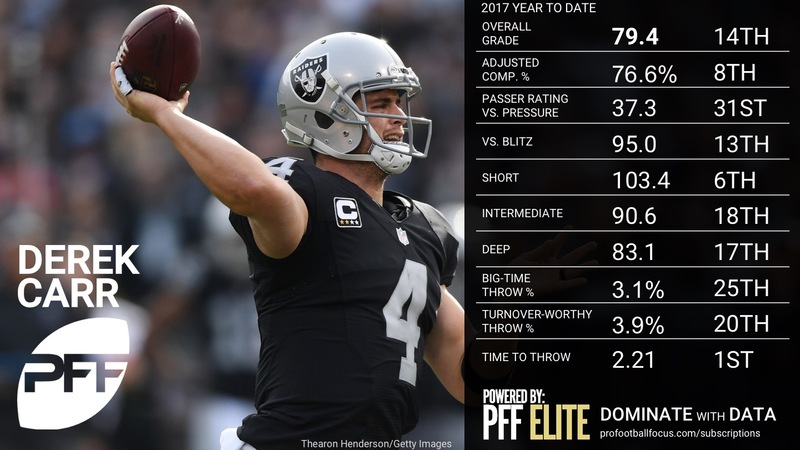 Coming into the game, Carr and the Raiders used play action the least amount of play in the NFL at 9.9 percent, with Carr’s passer rating sitting at a measly 67.7 and third-lowest in the NFL. 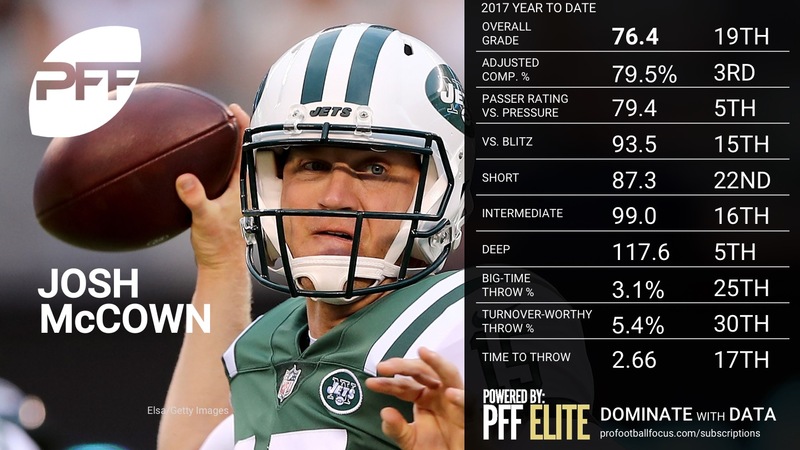 The Raiders used play action more often (19.4 percent) and more efficiently, as his passer rating for the season jumped 24.5 points, to 92.2 after this game alone. Coming back off an injury, Cutler played with a decisiveness and discipline that we don’t see out of him too often. 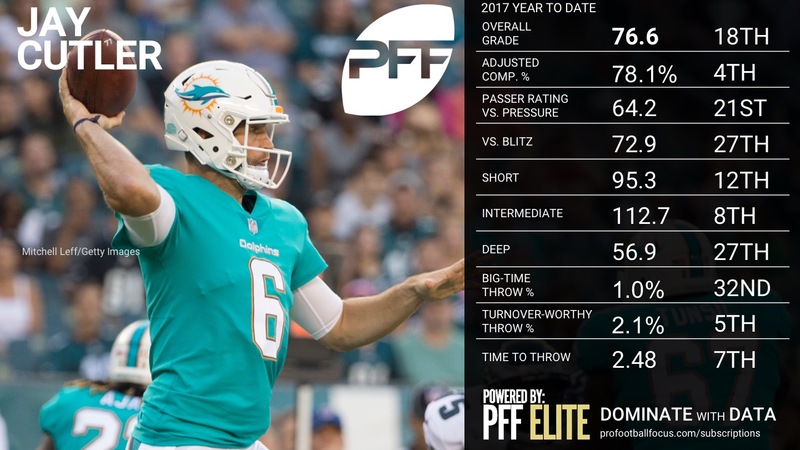 Cutler carved up the Raiders zone schemes, throwing with great accuracy (highest adjusted completion percentage in NFL Week 9 at 89.5 percent) in the quick timing and rhythm passing game underneath consistently finding the open man. 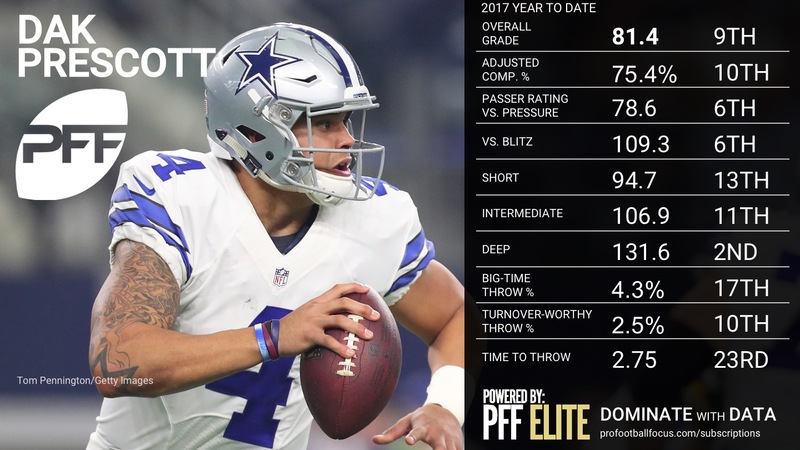 On throws traveling less than 10 yards he was able go 27-of-29 for 189 yards and two touchdowns, consistently giving his guys ample run after the catch opportunities. 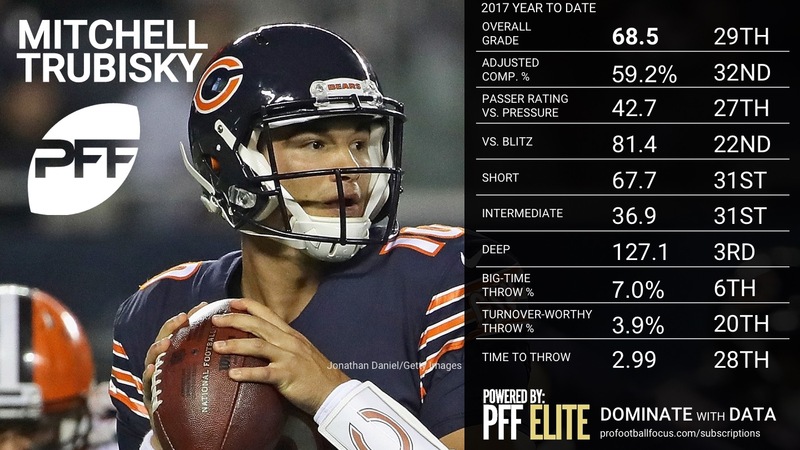 Cutler played well in virtually every facet of the game, with the sixth-best passer rating in Week 9 of 120.4 in a clean pocket, and the fourth-best passer rating of 112.3 under pressure. It was a smooth outing for Goff who hit on one of his best passes of the sesaon, a 67-yard touchdown to WR Sammy Watkins on a post route that traveled 51 yards in the air. He also had another well-placed deep ball down the right sideline and a red zone pass up and away from coverage that WR Cooper Kupp was unable to haul in. 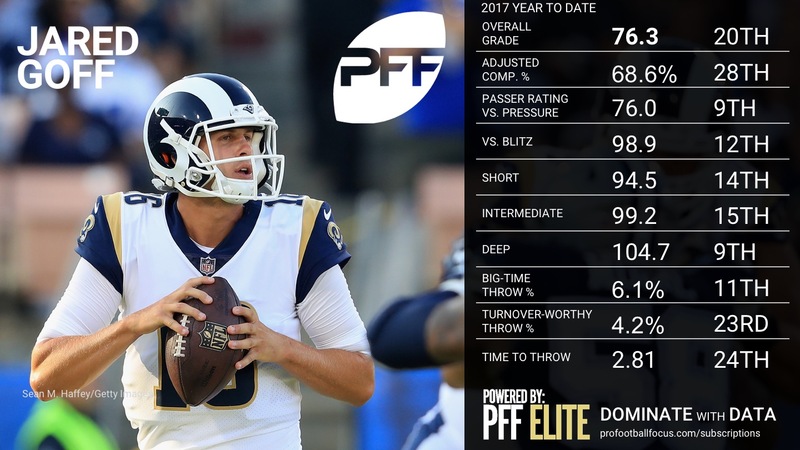 Goff’s stat line, 14-for-22 for 311 yards and four touchdowns, was certainly aided by a 52-yard screen pass for a touchdown on 3rd-and-30, and the Rams’ offensive line was very strong in pass protection throughout the afternoon, but it was one of Goff’s better games of the year and a step back in the right direction after struggling in Weeks 4-through-7.